When faced with the pressure of producing a marketing video that clearly and effectively informs your audience, creative elements sometimes fall through the cracks. We spend so much time on the who, what, and where that we often forget about the how. What you want to convey and through what platform are typically the first things that you should decide. This means that the visual language that relays the message is often done in a rush at the last minute. We spend so much time sifting through image after image, video after video… Some of them are great, but most of them are terrible. If we spend so much time and energy on viewing, shouldn’t marketers spend more time on brainstorming visual solutions? The how in today’s world is visual because of the image-flooded social media communities that we engage in frequently. This leads to a common obstacle: quality visuals are hard to create on the fly. In the advertising boom of the 1960’s (think “Madmen”) provocative and unique visual solutions were of paramount importance. The marketers of that historic era understood the importance of the concept of thinking visually. The typical client of that day (which is the same as today) had a product that they wanted to show and sell to the world. The difference for the client today is that there is so much more competition. The logistics of a production are obviously important, but don’t let the how suffer because of other important processes. 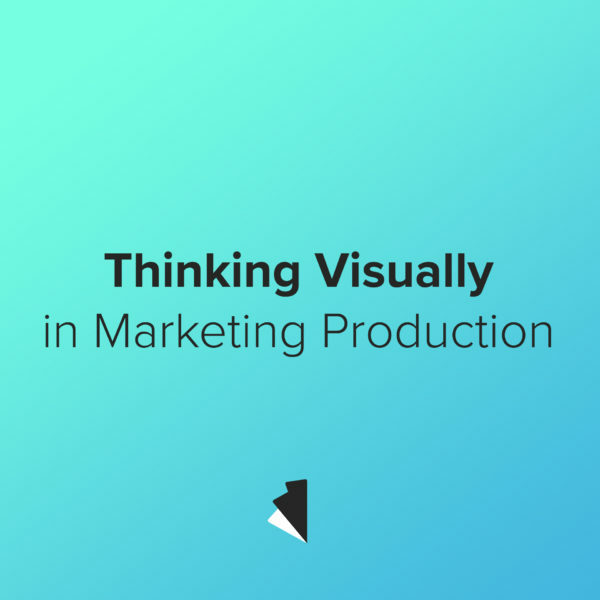 If you don’t know exactly what you want your visual marketing to look like and how it will get it’s message across work with us on refining your idea!